Fig 1. 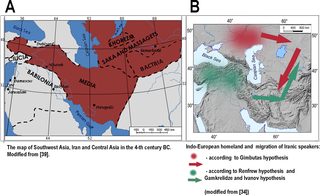 Ancient migrations of Iranic-speaking populations. Y-chromosomal haplogroup G1 is a minor component of the overall gene pool of South-West and Central Asia but reaches up to 80% frequency in some populations scattered within this area. We have genotyped the G1-defining marker M285 in 27 Eurasian populations (n= 5,346), analyzed 367 M285-positive samples using 17 Y-STRs, and sequenced ~11 Mb of the Y-chromosome in 20 of these samples to an average coverage of 67X. This allowed detailed phylogenetic reconstruction. We identified five branches, all with high geographical specificity: G1-L1323 in Kazakhs, the closely related G1-GG1 in Mongols, G1-GG265 in Armenians and its distant brother clade G1-GG162 in Bashkirs, and G1-GG362 in West Indians. 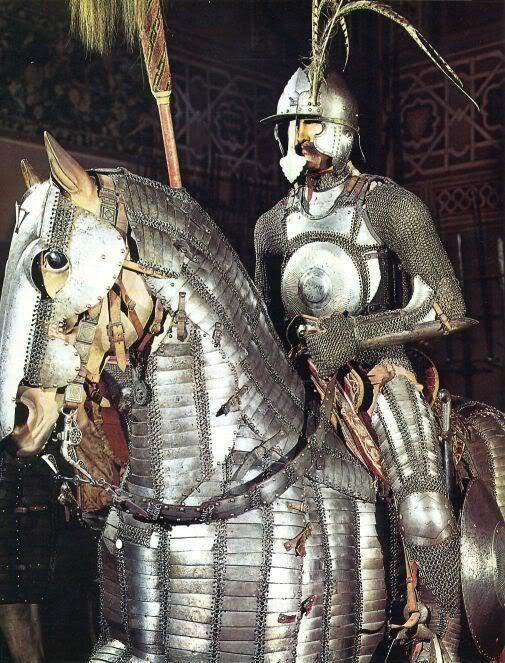 Full armor of rider and horse of an Ottoman qapikulu (heavy cavalryman of the “court slaves”, similar to the Mamluks). He also has a metal kalkan shield (Museo Stibbert Florence). 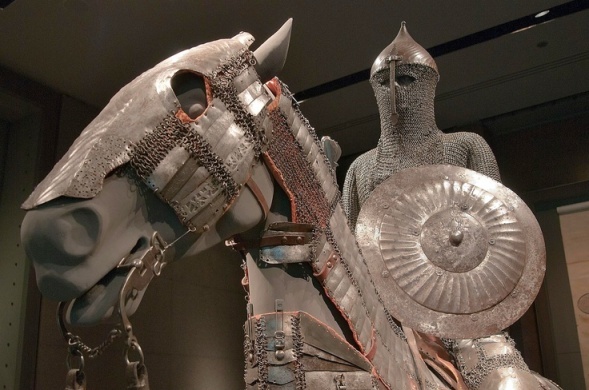 An Ottoman full armor of rider and horse (Museum of Islamic Art, Doha Port Doha, Qatar.). In the following images, I present an indicative collection of arms and armour of the Turanic empires and peoples of the late Middle Ages and the Early Modern Era (according to European chronology) which witnessed the greatest extent of the Turanic realms. 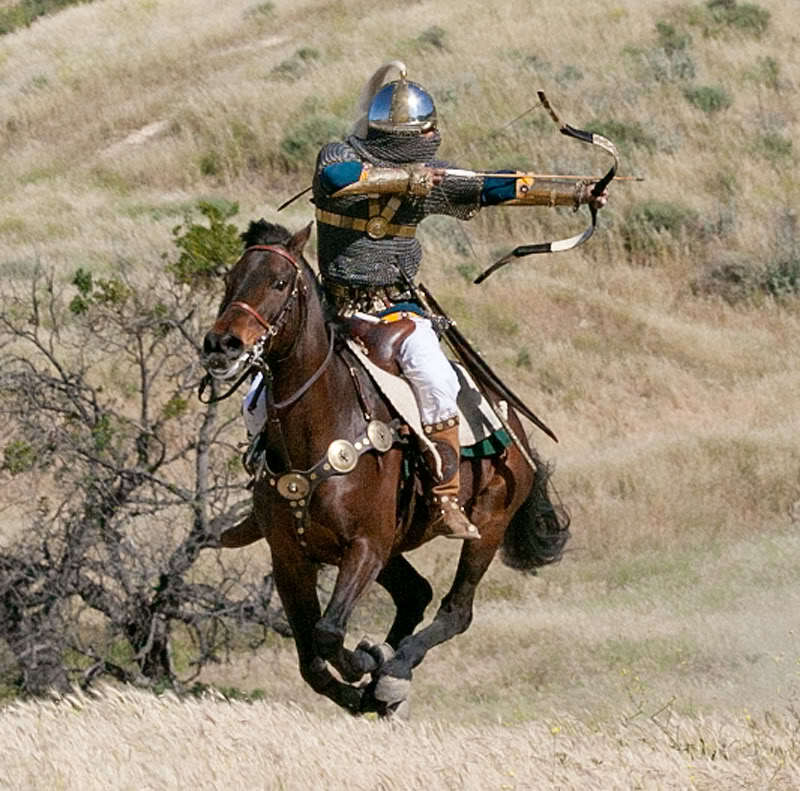 They are arms and armour for men and horses, coming from the Sultanate of Delhi, the Mughal Empire in India, the Tatars of the Golden Horde, the Ottoman Empire, the Mamluk Sultanate, the Turkoman-controlled Empires of Iran, the Central Asian Turanic tribes and elsewhere. The images are taken from museums and organizations such as the Metropolitan Museum of Art (New York), Furusiyya Art Foundation, Topkapi Palace Museum (Constantinople), Museum of Kulikovo Battlefield (representations by M. Gorelik whom I sincerely congratulate for his lifetime work), Museo Stibbert in Florence, Museum of Islamic Art in Doha, Qatar, the Royal Academy of Arts (London) and others. If I do not know the museum of origin of an image, I mention that in its caption. The vast Asiatic steppes from Manchuria to the Ural River had always been the cradle of nomadic peoples of intense mobility and warlike character. Dashing from this cradle, they used to debouche in order to gradually form nomadic “empires” (sometimes as far as the Hungarian plains) and invade the territories of sedentary peoples such as China, India, Iran, the Greco-Roman regions of the Mediterranean and later the Christian countries of Europe. 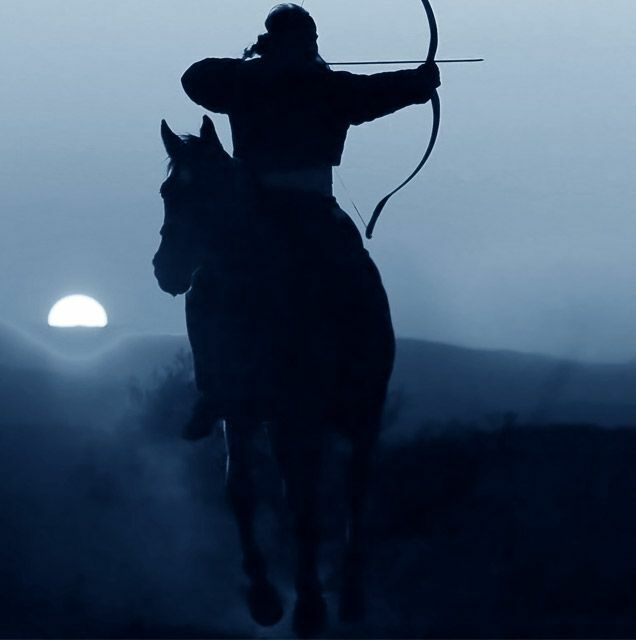 The European World was equally exposed to the lethal hordes of these horseback warriors of the steppes, as well as the Chinese, the Indian and the Iranian World, paying a heavy toll in human lives and material damage, from the Early Antiquity to the Late Middle Ages. The Iranian Saka (Eastern Scythians) were perhaps the first nomadic people who formed a powerful tribal union (rather a confederation) in Central Asia, the “Great Horde of the Saka” (Ma-Saka-ta), whose name the ancient Greeks linguistically Hellenized and quoted in their writings as Massagetae. This tribal union was followed by other nomadic confederations of Tocharian, Turkic, Mongol, Tungusic, Yeniseic and other origins, such as the Wu Sun (Wusun), the Hsiung Nu (Xiongnu, the Huns? ), the Yue Chih (Yuezhi), the Hsien-pi (Xianbei), until the emergence of the Juan Juan (Rouran, Avars). 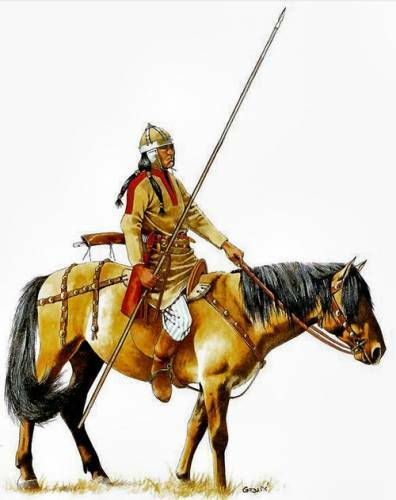 A reconstruction of a Sassanian medium cavalryman by Ardeshir Radpour. He bears a mail cuirass, a helmet of composite structure with mail visor adopted by the Romans as well, forearm-guard plates, light lance, a composite bow of the Sacian type (heritage from the Parthian predecessors of the Sassanids) and a cavalry sword (Image by Ardeshir Radpour). 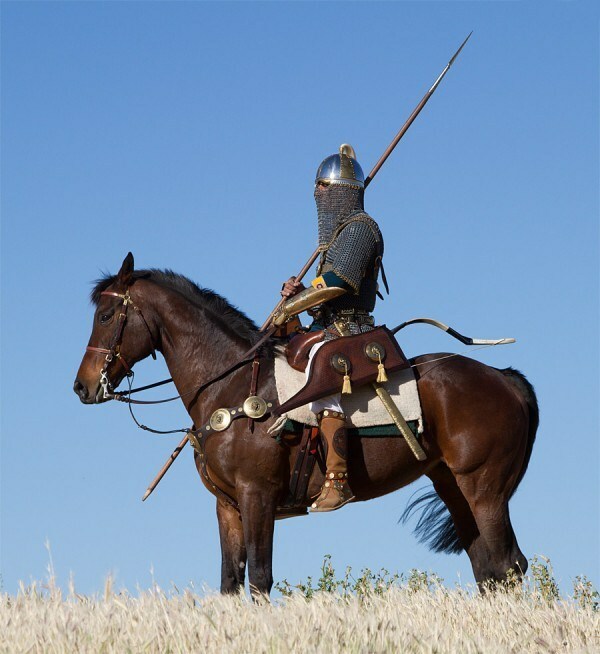 The infantry (and partly cavalry) of the Qadisini and the ‘Immortals’ are also mentioned in the medieval sources (mainly Byzantine) as parts of the Sassanid army. The Qadisini were the Arabo-Aramaic people of Qadisiya (in Arabic), a Semitic region subject to the Persians in modern Western Iraq. The ‘Immortals’ (Varhranigan khvaday in Iranian) were the elite corps of the Persian army, the palace guard of the Great King, corresponding to the homonymous personal guard of the ancient Achaemenid kings of Persia. Xerxes’ ‘Immortals’ had fought against the Greeks in 480-479 BC without success. The Sassanian Empire, claiming steadily the whole Achaemenid heritage had reestablished this unit. Another unit under the direct orders of the Sassanid monarch was called ‘self-sacrificing heroes’. One of the commanders of this unit was of Byzantine origin. This possibly indicates that they were mercenaries or foreign fugitives sheltered by the Persians.